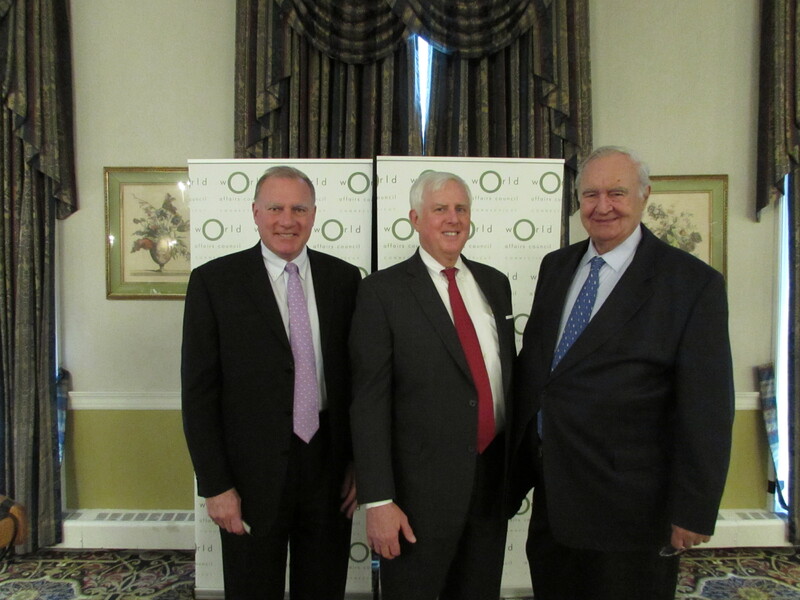 This past Wednesday February 19th, Arthur House, current Chairman of Connecticut PURA, spoke at a Global Conversation Series Luncheon to council members and interested guests. Mr. House has had extensive experience in the arena of intelligence and national security, and was kind enough to speak to our council on the current state of the United States’ intelligence community and perceived security threats. To watch the program, broadcasted by C-SPAN, click here. House has a Ph.D. in international relations from the Fletcher School at Tufts University. House began his career as Assistant Dean of the Fletcher School of Law and Diplomacy at Tufts, then held a faculty research position in political and economic development. He has been a visiting faculty member at the National University of the Congo, Georgetown University’s Graduate School of Foreign Service and the University of Connecticut graduate school. Arthur House’s experience extends to matters of national security, international affairs, government relations and global corporate relations. House was a White House Fellow in the 1970s. During this time, he served as a special projects officer at the National Security Council and reported to the Assistant to the President for National Security Affairs. He held high security clearances and reviewed and analyzed classified information and correspondence. He actively managed security council crises. House held several positions at CIGNA Corporation in the 1980s. He was Vice President, Government Relations and directed CIGNA’s public affairs work and its participation in national business organizations. 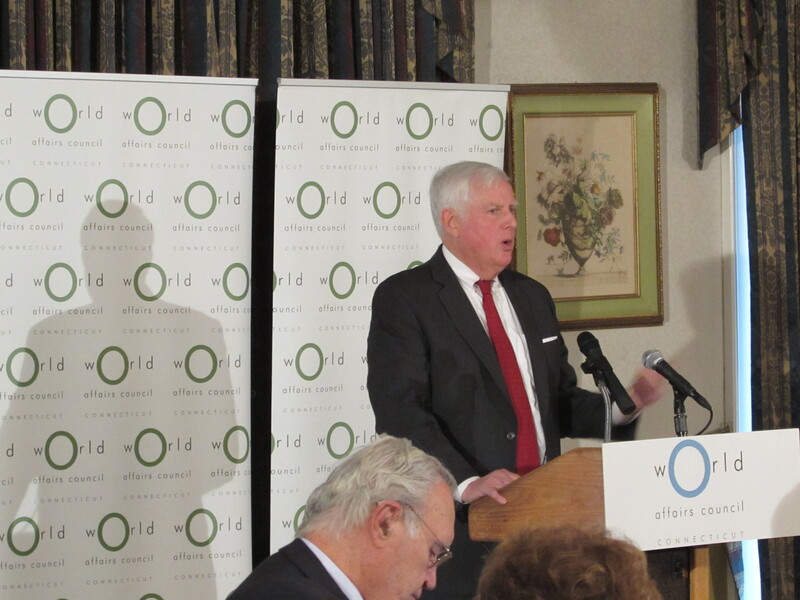 He led CIGNA’s international relations program and managed several economic and political issues facing the company. House’s varied corporate, governmental, and international experience lend him the knowledge and analytical skills necessary to interpret the current state of intelligence affairs. On Wednesday, he did just that for our council. House was introduced by World Affairs Council of Connecticut Chair Emeritus Peter Kelly, and then began his speech with a few anecdotes about long-standing council members and friends, as well as references to former outstanding Connecticut intelligence field members such as Nathan Hale, a revolutionary war hero best known for his last words, “I only regret that I have but one life to give for my country,” and John Downey, a CIA operative held captive in China for 20 years. For more information on Nathan Hale, click here. For more information on John Downey, click here. House gave a condensed rundown of the U.S. Intelligence community, outlining the 16 intelligence agencies as well as the Director of National Intelligence. He stressed in this outline the two most important factors in managing covert action: a strategic approach and long-term analysis. These two phrases were a keystone in his speech, he stressed them at every level of intelligence and in each current global issue. The U.S. Intelligence and Security Communities focus on these two approaches to analysis and security. Arthur House delivering speech to Council audience. House moved on to discuss the challenges facing the intelligence community. He stated that it is the job of the analysts, operatives, and administration to combat these challenges. The U.S. has a strong intelligence community, and our agencies specifically excel in human intelligence, the traditional “spy,” as well as technological espionage. However, there exist cyber threats, terrorism, and regional disparities and concerns. These challenges pose a threat to the U.S. public, and the intelligence community works to combat them. As many may know, the most recent intelligence threat was the Snowden Controversy. In 2013 Edward Snowden, a low-level information technology government contractor, accessed and leaked reams of government documents to the media. After leaking the documents, Snowden fled the country and has sought asylum in China and Russia, where he currently resides. Snowden has been both celebrated and condemned, and Arthur House addressed this issue with the council. For a timeline of the Snowden Controversy, click here. House did, however, address those of the opposite opinion. He explained how some people view Snowden as a hero for exposing supposedly unethical government actions. Immediately following, House stressed that both the House of Representatives and Congress both investigated and found the documents legal and ethical. The Snowden Controversy significantly impacted public opinion. It created a blatant distrust of the U.S. intelligence community by both the American public and more detrimentally, foreign governments. Snowden’s actions will have a lasting effect on the relationships it damaged. Despite the controversy surrounding the Snowden leaks, and the imminent intelligence threats, House is hopeful and highlighted the positive aspects of the U.S. intelligence community as it moves forward. The U.S. intelligence community has strong leadership, it excels at integrating its various agenices, and is supported by congress. Arthur House used his background in government and international relations, in combination with his intelligence expertise to deliver a speech that covered the current threats to the U.S. intelligence community, as well as an insight into the tasks and functions. Thanks to Arthur House, our council audience left with a better understanding of the U.S. intelligence community, and a framework to better understand modern espionage and security threats the United States currently faces.